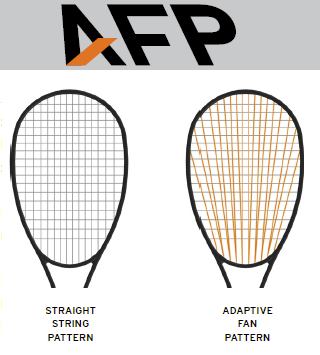 Adaptive Fan Pattern (AFP) technology allows you to customize your string pattern to maximize your game. With HEAD’s new racquet and bumper technology, you are able to choose between the traditional straight pattern or the more dense fan pattern each time you string. HEAD’s Straight String Pattern is designed for players looking for maximum power with optimal touch and feel. HEAD’s new Fan Pattern is designed for players looking for a stiffer string bed. This dense fan pattern increases the stiffness of the string bed increasing control while maintaining power with longer main strings.